The Lord of the Rings: Extended Edition - out soon? There’s no word yet on the actual release date, but The Lord of the Rings: Extended Edition, mostly in the Blu-ray format, is on the way. It will be a 15 disc box set, and although there’s nothing new, this is the most complete collection of the extended editions of the three films, and of bonus material. I said above that the set will be mostly on Blu-ray. The films are in the Blu-ray format, with 30 minutes of extra footage added to Return of the King, 43 minutes added to The Two Towers, and 50 minutes added to Return of the King. The bonus material will be standard definition DVD. The collection will be as previously packaged in the The Lord of the Rings: Extended Edition on DVD, added to which will be the three behind-the-scenes documentaries by Costa Botes, the filmmaker hired by director Peter Jackson. 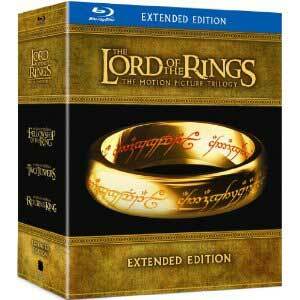 The Lord of the Rings: Extended Edition will be available from Amazon from June 28 , at a price of US$83.99. Find below a list of all the ‘disc-bound’ bonus material. In addition the boxset will provide access to exclusive online features. “Cameron Duncan: The Inspiration for ‘Into the West.